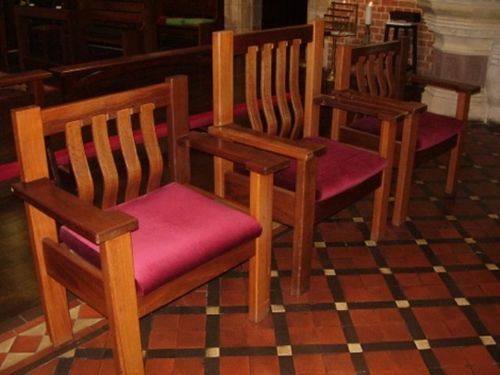 Three Bishops’ Chairs with their red cushions commemorate Perth’s third Archbishop, the Most Reverend Robert Moline. The Most Reverend Robert William Haines Moline, MC, MA, DD (20 October 1889 - August 1979) was the third Archbishop of Perth. Decorated for wartime service with the Rifle Brigade he was ordained in 1921 and began his ecclesiastical career with a curacy at St Matthew’s, Bethnal Green after which he joined the Brotherhood of St Barnabas in North Queensland. He was its Warden from 1925 to 1927 and Archdeacon of the area until 1929. Returning to England he was Rector of North Cadbury then of Poplar. From 1940 until 1947 he was Vicar of St Paul’s, Knightsbridge when he became Archbishop of Perth, a post he held until retirement in 1962.